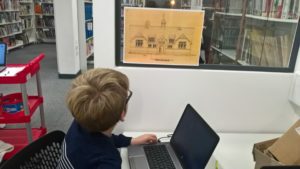 Crewecraft was a fantastic project for young people in Crewe to learn about the heritage and historic buildings of the town by recreating them in Minecraft. Working with digital artist Gemma Latham, and supported by Cheshire Archives, the sessions enabled learning about the history of the town through reconstructing the designs of old buildings and landmarks within digital worlds. Funded by the Heritage Lottery Fund ‘Young Roots’ programme, the Crewecraft project was delivered as part of SHIFT by Cheshire East Council’s cultural economy team, Cheshire Archives and public libraries . Minecraft is digital game, which has captured the imagination of young people who access the computer game to develop their creative and digital skills. Families and young people took part in a series of workshops to re-create Crewe’s historic buildings in three-dimensional digital formats. It has brought together history, heritage, architecture and digital design in one exciting and fun learning experience. Below is an image created of people from an archive image imposed into a Minecraft Crewe town centre. Workshops took place at Crewe Library together with a number of public events, including the Crewe’s Traction Festival in July. The project was encompassed within the Council’s SHIFT programme, which celebrates and promotes digital learning and skills development across the borough. Those participating have developed strong team-working abilities and communication skills, while library staff have also learnt new digital skills through the Minecraft map. Five of the young people have acheived their Bronze Arts Award. Completed maps and resources, including photographs, video and archive material, are available here.